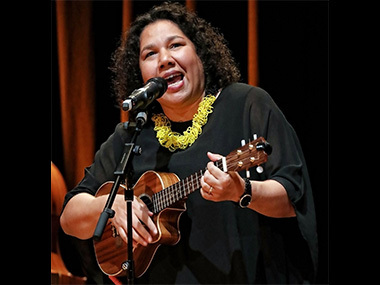 The Sydney Festival kicked off with two Torres Strait Islander tributes – Jimi Bani's autobiography at Belvoir (which I've missed) and Jessie Lloyd's on-going 'Mission Songs' project to collect the music which kept exiled Indigenous people alive during the 'Mish' era, from roughly 1901 until 1967. For the plan to assimilate them into white society and de-tribalise their languages and cultures was pretty brutal, even if operated by people of a religious persuasion. This show at Campbelltown Art Centre over the past weekend was just a part of that project – a part involving four generations of Lloyd's Gaia family. They were originally from the Torres Strait, but settled happily it seems on Palm Island, where the 'worst of the worst' Aborigines from Queensland would later be exiled. Great-grandfather Gaia was originally a pearl diver on Thursday Island in the TS but moved south to help construct the new settlement on Palm Island – TI to PI, as one of the show's songs explained. He brought his music with him and helped to produce the first baby born on PI – Jessie's grandfather Albie. And it was Albie who was the trouble-maker who lead a strike of 6 other islanders in 1957 against the “enforced apartheid” of the island Superintendent (I quote Lloyd, who does much talking between songs) and a seemingly not unpleasant 30-hour working week. For 5 days, they brought the island to a standstill, until the cops from Townsville arrived before dawn and tied them to their boat's mast to exile them again to mainland Queensland. But the men kept on singing, and for the first time in the show, I felt moved by some real TSI music – the sort that should have been accompanied by the heavy beat of island drums, often wielded by large and powerful ladies. Sadly, the music had no effect upon the cops, who ended up taking 23 family members of the strikers' families away from familiar PI and making sure they never colluded again by spreading them out around Queensland's missions. A small event, but well worth discovering – especially in the mellifluous setting of Lloyd's show. 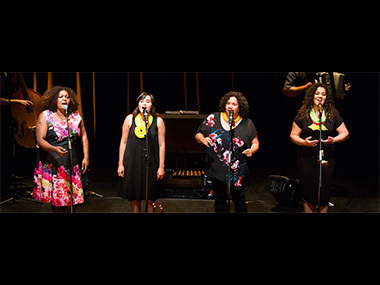 She was joined by 3 other Indigenous singers – the renowned Emma Donovan singing sweet and low, and the younger Jessica Hitchcock and Deline Briscoe with gospel descants, both with northern Australian connections. Behind them, a sensitive, flat-capped band of four provided folksy backing – especially Graham Griffith's laconic pedal steel guitar. Lloyd herself added a ukulele, which lent itself to what I pejoratively call 'cheesy Hawaiian' sounds that have clearly infected much of the Pacific. But who can complain when an iconic treasure like “The Irex”, melancholically recalling the ship which took people away – either to or from PI – separating families cruelly, yet still deserving memorialising in a sad song. Two questions arose, though, from this informative show. When Albie Gaia reflected on his radicalism just before his death in the 1980s and came up with song including an early demand for land rights in the form of “our native land”, was he referring to the land he'd grown part of during his original exile to PI, to his source-land on TI, or to the mainland home he now inhabited? The Queensland dislocation system was brutally effective and deliberately confusing. And why – two years running now in the Sydney Festival – does poor old Norman Tindale come in for such abuse? Last year it was from an expected (if misinformed) source in artist Vernon Ah Kee. This time, Tindale's anthropological description of Albie Gaia as “a quarter-caste cross Islander” was dismissed by Jessie Lloyd as from a time when it was “normal to be racist”. But Tindale probably did more than anyone to establish a continuity in the sort of dislocated Indigenous history of Queensland that now permits rights to “our native land” to be identified. And Albie himself went on to write an achingly sad song about the pain of being half-caste - “not welcome in either camp”, “unable to join the corroboree”, “half-caste equals outcast”, which clearly shows the acceptance of such designations in an earlier time. It also reveals how unwelcome the products of miscegenation were in the traditional Aboriginal system. I've never forgotten the pain with which the East Kimberley's Paddy Bedford told me of his mother's first, half-caste child being drowned by her elders, unable to accept this first case of a relationship across the racial divide. Utopia artist Barbara Weir tells the same regrettable story of her mother, Minnie Pwerle being forced to reject her. Jessie Lloyd ends with a quite justifiable claim that these 'Mission Songs' should become well-enough known around Australia that they could stand beside 'Waltzing Matilda' in the national songbook. Why not? Though, going on to claim a “new genre in Australian music” may be a step too far. For the music – apart from a couple of TSI originals - is mostly familiar and derivative – as is 'Waltzing Matilda'. A standout, though, for me was the work of a young Noongar musician, writing the song 'Mission Days', which emerged as powerfully anthemic. Sadly, I missed her name. You may have missed this show - but Campbelltown Arts Centre continues to offer the wonderful Maori art of Lisa Reihana - mostly multi-media, both engaging and clear-headed - in her first survey exhibition covering three decades of work.